In keeping with the rules that I give my daughter Hannah when she’s traveling, I didn’t tell anyone what we were up to here in Costa Rica a few days ago. I always hated it when Hannah was in SE Asia and would tell me, ‘Mom, tomorrow I’m going bungee jumping’. I told her, the best way to tell a mother something from across the globe is: ‘Mom, YESTERDAY I went bungee jumping and all is well!’. In any case, our loved ones got to hear this story in the past tense – because we love them and there was no need to cause worry. Let me start off by saying the medical system here in Costa Rica is very good. Well, not too many. Even though we didn’t speak Spanish and they didn’t speak English, we got our injuries attended to in short order. Well, the kids, having the gift of youth and ignorance, thought it’d be a great idea to rent motorbikes (scooters but they can move pretty fast) and take off south to see the countryside. I have to admit, it was really fun for the most part. I was secretly somewhat terrified and sure it’d be me that’d fall off the bike, but it was not. Our ‘tag-a-long-head-chef’ DJ (my daughter’s boyfriend) was leading with my daughter on his bike and Sam and I were behind. By this time I had calmed down a little and replied, “I sure am… OMG!…” The words came out of my mouth just as we watched the two in front of us hit the ditch. DJ took a corner a little fast and hit gravel and then the ditch. We picked ourselves up, brushed ourselves off and backtracked through a little town where we saw a clinic. 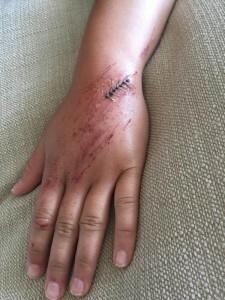 Remarkably, it turned out that Hannah only needed 6 stitches in the top of her hand. She has some skid marks and a bit of road rash, but DJ picked a grassy/gravelly ditch to dump into instead of the concrete ditches most other places. Dr. Juan Gomez stitched Hannah up, x-rayed her, gave her antibiotics and sent us on our way. We were in and out of the clinic within an hour and only $160 lighter in the wallet. DJ got a few scrapes but the worst for him was the damage to his pride for dumping the bike in the first place. We had an uneventful trip back to Tamarindo as we all thoroughly enjoyed the beautiful countryside. Hannah was a trooper through it all and can ‘brag’ that she’s hit a few medical facilities around the globe now. Also, instead of a tattoo, she’ll bring home a cool scar on her left hand. Now, as far as fitness you may be asking? If you enjoy this style of workout, you should check out my newly revamped 21 Day Fat Loss Challenge. You’ll get follow along videos, including body weight workouts to direct and motivate you where ever you find yourself this summer. As for us, we could grow accustomed to this lifestyle here in Costa Rica, but sadly, all good things must come to an end. It’s back to Canada for us. Then I’ll be reporting in from a road trip. I’ll keep you posted on more travel style workouts on the road – this time from Kelowna where I’ll help my Dad move into a retirement home.